We have a new team taking a major title from the established favorites. We have a 2nd Chinese team break into the highest tier of competitive play. Paparazi has been one of the best Chinese players for a few years, it’s great that now he has a major title to show for it and a good enough team to challenge for the TI title this year. Below I’ll try to take one important lesson out of each of the grand final games that we could apply to our own pubs. Unfortunately for VP, by the end of the laning stage, the result was 9-0 in favor of VG. The good news was that the overall resource difference wasn’t too bad because they were farming OK in the lanes. The bad news was that Paparazi was gaining momentum on Morph, while Pasha (VP’s main team-fight control hero and space creator) was slowly falling behind. It’s interesting to note that in the three games that VG won Paparazi didn’t have a single death, while Pasha didn’t have a single kill (with a KDA close to 1). Although three games are not enough to draw a solid conclusion, this looks a bit like a trend. It is quite possible that countering Pasha makes it much harder for VP to win because Pasha plays their main space creator, while Noone and Ramzes play cores that need space to farm. This means that when Pasha has a bad game it’s hard for VP to control the map. Consequently, Noone and Ramzes lack enough space to farm and they have a hard game as well. Alternatively, if the enemy team targets either Noone or Ramzes with their early aggression, even if one of them has a bad game the other one will have the space to take over and carry. The cores in a team can generally fall into the category of a space-creator or space-taker. If the enemy team has two space-creators and one space-taker, it makes sense to pressure the space-taker as much as possible so that he isn’t able to freely farm and utilize the space that his team is providing for him. If the enemy team has two space-takers and one space-creator, it makes sense to pressure the space-creator. If he has a bad game, it would be hard for the enemy team to control the map, which means their two greedy cores will have a difficult time finding enough space to farm. Having a hero with a save mechanism is becoming more and more important to the degree that teams rarely play lineups without one. With proper positioning on your side, the enemy team will have to initiate a fight on one of your farmed cores because they will be the only heroes showing on the map for long enough. Once this happens, a well-timed save can single-handedly mess-up the enemy initiation and even turn the fight around. In this game, for example, the heroes that do this job are Oracle on the side of VG and Shadow Demon on the side of VP. First, he is playing against Doom – if Pasha puts his ultimate on him, he effectively nullifies Oracle’s impact in the fight. This is definitely an option, but it is hard to do and often Doom would want to save his ultimate for a core like Weaver or Arc Warden. Second, he is playing against Anti-Mage, for whom it is really easy to find Oracle in the fight and focus him thanks to Blink – this happened multiple times this game. This forces Oracle to use his defensive mechanisms and items on himself, which is not ideal because it leaves his Weaver and Arc Warden vulnerable. Anti-Mage was overall a brilliant pick this game. He is great against Oracle and Arc Warden because he can easily jump on top of them. He is good against Dark Seer because he has a big mana pool and becomes a great Mana Void target in fights (AM is also good against DS in the lane). Last but not least, VG’s lineup lacks enough disables to lock AM down, which meant that they simply had no answer for Ramzes in the mid and late game. Usually, when you are drafting you want to counter the enemy cores (especially pos. 1 & 2) and don’t think too much about the enemy pos. 5. Against Oracle (or other supports with a powerful save), however, if you don’t have a way to deal with him, he can make initiating favorable fights almost impossible. Having heroes that can easily find him, close the gap, and get on top of him is generally speaking the best tool you can give your team in the draft to take care of Oracle. 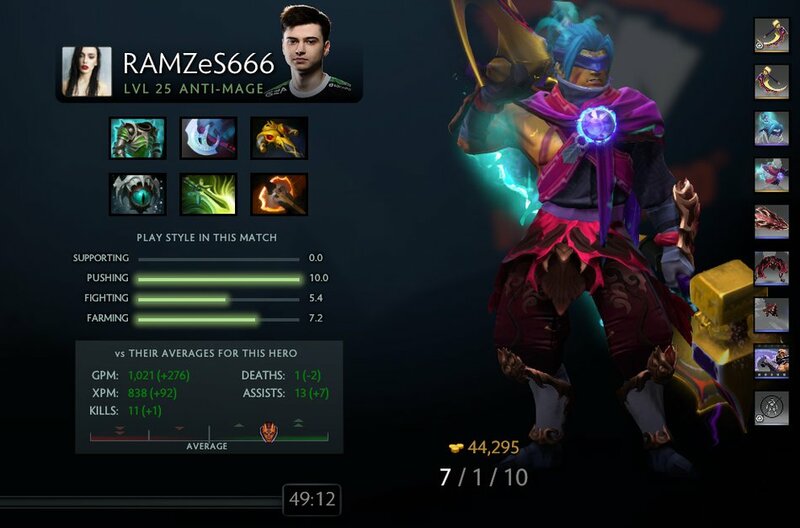 Pango was another hero that found great success at the major (although keep in mind he received a sizeable nerf in 7.21d which made it impossible for him to get both the Disarm and Silence with Lucky Short). He was played in 32 games and had a 59.38% win rate. Bloodseeker is arguably the single strongest counter to Pango because of how the two ultimates interact. Pango’s main impact in team fights comes from Rolling Thunder. Rupture, however, pierces Rolling Thunder’s spell immunity and deals very high pure damage while Pango is rolling. This practically means that Pango has to cancel his ultimate or risk dying very fast, which decreases his impact in fights significantly. Bloodseeker is a forgotten pick in this meta for one reason or another, but this doesn’t mean that he cannot be useful in the right situation. Ori finished this games with a stat of 10-0-5 and with hero damage two times more than the hero with the 2nd highest damage in the game. It should be mentioned that while VG picked Blood to counter Pango, they actually focused most of their early game attention on Pasha’s Dark Seer, which returns us to our Game 1 lesson. VG managed to kill Pasha 4 times before the end of the laning stage thanks to the rotations from their supports as well as Ori. Even the top meta picks (like Pango mid) have hard counters. Playing said counters on a high level is a great way to secure pub victories in certain metas. That said, if you are not good enough on the hero, picking it is typically a mistake. You would usually have a higher impact on a hero you are very comfortable with rather than on a hero that counters the enemy team but that you cannot play well enough. Our experience shows that picking a direct counter you cannot play is a common mistake from 2 to 4k MMR where you’ll find better results simply perfecting your mechanical skills and game sense on a smaller hero pool. Game 4: Who's that handsome devil? VP went for a very unconventional pick in this game – this was the first time Storm was drafted in the whole major. This curveball made the game quite hard to predict and interesting to watch. Moreover, Storm has been receiving buffs lately (7.21d included), which means it’s possible that he’ll slowly sneak his way into the meta, so it was interesting to see how he fares. VG have a more conventional draft with a very strong 5-man timing in the mid game. At the same time, neither Jugg nor Storm are great in deathball strats and fights before they get a lot of items, so it was interesting to see how VP would handle the situation. One thing that we noticed immediately is that this game VP put a lot more effort into securing a good start for Pasha. They put supports in his lane for a large portion of the laning stage and as a result he started the game with two kills to his name and very decent farm. This game it was actually Yang (the offlaner of VG) who had a difficult time in the lane and didn’t find a lot of farm. Moreover, in this game, VP didn’t rely solely on Pasha for creating space. Storm is a powerful ganker and Noone made sure to make rotations and join fights after the laning stage. This made a big difference and unlike in the games they lost, VP had great map control in the early-mid game and were able to out-farm VG slightly. This delayed VG’s 5-man timing, which was very important for a game in which VP want to have a couple of items on Jugg and Storm before big team fights start to take place. 5-man Dota is always in fashion and arguably it’s the easiest and most successful strat in pubs. In cases where you are facing a 5-man lineup with a strong mid-game and your team is better in the late game, it’s a good idea to try to slow down the enemy push timing. Your best bet is to try to control the map through ganks and split-pushing. This will force your opponents to react to you on different sides of the map and will make it difficult for them to gather up as 5 without losing map control. Doing this for long enough (even if you get even trades) will buy time for you to find the core items that you need to take team fights more comfortably. The roles were reversed in Game 5 - VP were the ones with a strong 5-man Dota push timing in the mid game with heroes like Lycan, Undying, Shaman, and Doom, while VG had a theoretical late-game advantage mainly thanks to Medusa and Prophet. Initiation and control are useful in all situations, but disables are not that vital for the team that is playing from ahead. This is because if you have a fight advantage, you don’t need to chase the enemy team around the map and try to catch them. You can simply push as 5 – objectives are more important than kills. It would then be up to the enemy team to react and defend their towers. If they don’t, they quickly lose objectives. It’s hard to react, however, when you are playing from a resource deficit and when you don’t have powerful initiation and control. The main reason it’s difficult to push the enemy base is because the ramp chokepoint and high-ground vision give the defending team an initiation advantage. Without initiators, however, the defender advantage is limited to rejoining the fight quickly through buybacks. Moreover, even if after a prolonged fight the defenders are able to push the enemy team back, they are unlikely to secure kills because they lack the disables needed to stop the enemy team from disengaging. This means that when you don’t have disables, you lack the tools to punish the enemy team for playing aggressively. Because of this, the terrible laning stage and early-mid game meant that VP had no chance for a comeback and they were forced to tap-out in 21 minutes against a Medusa + Prophet lineup. The reason VP and VG didn’t have stuns in their drafts wasn’t because they don’t know stuns are important. There are NO perfect drafts in Dota an in high-level games sometimes you need to give up on something important to gain something else in return that you believe will secure you the victory in the specific game. Sometimes these gambles work out, others – they don’t. In pubs, however, where mistakes are more common and the outcome of the game is much more random, it’s generally speaking a good idea to stick to well-rounded drafts. A lineup without any stuns will more often than not lose you the game. A well-rounded draft gives you more options when things don’t go as planned. When a favorite and an underdog clash with two well-rounded drafts, the odds are usually heavily in favor of the higher-tier team and the odds will reflect this. But when the underdog uses an all-in strategy, they have a real potential for an upset if the favorites don’t figure out a solid counter fast enough and this might not be reflected in the official odds. All-in drafts usually have a timing in which they have to take control of the game. If it seems that the all-in draft is moving according to plan this might make it very valuable to bet on the underdog.